I'm eagerly awaiting the 2018 prediction from Nathan Rao (Daily Express columnist) for the UK winter weather. He normally trots them out about this time in October and hasn't got a very good track record. 2014 - Winter 2014 set to be 'coldest for century'. Britain faces ARTIC Freeze in just weeks. No, Nathan, - it didn't happen. 2015 - Coldest winter for 50 YEARS set to bring MONTHS of heavy snow to UK. Err, no it didn't, Nathan. 2016 - FREEZING BRITAIN: Bitter polar air to bring COLDEST winter for more than FIVE YEARS. Sorry, wrong again, Nathan. 2017 - UK set for COLDEST November for years: Heavy snow to fall in 2 WEEKS in Artic megafreeze....and wrong again Nathan. Oops - nearly missed today's story from Nathan - will he be right? "Shock" was the favourite of my local paper, the 'Welwyn-Hatfield Times', when I was growing up. We checked once, in about 1980. 2/3 of headlines over 3 months had 'SHOCK' in them. and when temperatures aren't "soaring", they are always "plummeting" !! Statistically he'll be right eventually. Meanwhile, the Indians are gathering wood as if there's no tomorrow! Reports this week said that temperatures in the UK were about to take a turn for the worse and that we could see snowfall by the end of this month. It was reported that Brits were about to start the cold descent into a 'four month Polar assault' till February next year. And the north of England was set to face a 'substantial' amount of snow, that could be more extreme than ' Beast from the East' . "I do not think that word means what you think it means"
3 to 4 metre snow drifts and no chaos in Canada whereas 2 millimetres here in the South East of the UK and trains stop running, motorways shudder to a halt and the newspapers declare Armageddon. If the temperature goes below zero and stays well down then it's OK. You invest in the snow-clearing gear and when you move it, it tends to stay moved. In the UK, the cost of the gear is high enough that it's cheaper to suffer the disruption when something bad happens, plus the temperature hovers either size of freezing and so there's wet ice, which is where the problem starts. Dry snow or ice is not nearly as slippery as ice with a thin layer of water on it. It might not be the case now, but some years ago, Heathrow Airport was the only place in southern England with a full set of snow-clearing equipment, because to them it was cheaper than closing for the day. One of our biggest problems in the Maritimes is that most years it doesn't stay below zero, and we have had 7 kinds of precipitation layers on the roads, all eventually frozen, in one night. This is due to the mixing of airmasses and the temp going up and down through zero several times. This makes driving a nightmare, and we basically all stay home , watch movies and eat stormchips. Over the winter, we normally get three or four thaws, so whilst there is 12 foot of snow on average, there's normally only four foot at one time. The second biggest problem is when there isn't any thaw, then you build up to 12 foot average, and with drifting (and we get a lot of that) even more. In 2015 we got 20 foot without a thaw, hence the pics. The further problem here is that there is literally nowhere to shift it to. The cities can fill the pavements which had been previously cleared, but one year the Western end of the Island had the schools closed for a week, because the kids couldn't safely walk even the very short distances to their bus pickups, and the banks of snow were so high one couldn't see round corners, so it was driving a 10 mph at most, and then only if you were desperate. 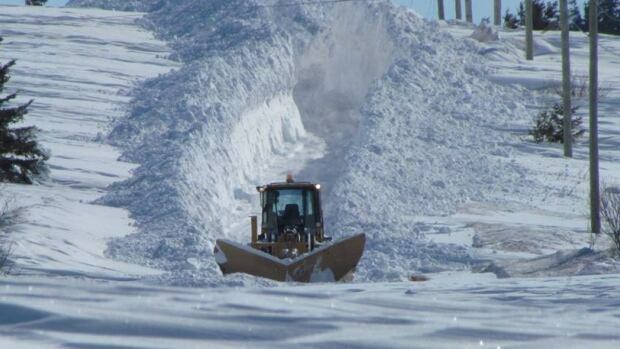 In these circumstances, we have to borrow the megablowers from Nova Scotia and New Brunswick, but of course it's normally at least a week until they've cleared their own roads. 1) Have a reliable vehicle, with full survival/dig-out gear - cell coverage can be zero in a blizzard, and people do die of exposure trying to walk home. 2) Do not try to keep to a schedule. 3) Have high ground clearance, four wheel drive, snow tires in that order. In fact I have never had snow tires, and don't see the need, but I can use 4WD LO, 4WD Hi, and 2WD up to 10 times each in a one hour journey. 4) Go round the usual 90 degree corners at 5 mph max, with very slow deceleration and acceleration, but one can build up to near normal speeds on the straightaways. 5) Visibility is often the biggest problem. Last week I saw the truck-mounted snowploughs being returned to the local depots after servicing - ready for the worst. Our local area has several high altitude (1000ft) rural settlements with roads up to 1900ft that occasionally 'have it bad'. In Lincolnshire, in 30 odd years we had proper winter snow maybe 3-4 times. I guess 88 we had drifts 10-15 feet. I got down the cleared road, i had winter studs on the front. Only a 4x4 got through as well. Got to work, camp roads cleared but all car parks blocked so drove home. Only place I ever saw one metre of snow fall in four hours - no wind, just snow and I measured the depth myself - north eastern Spain at 600' altitude. Temperature was -5° and it packed down into ice very quickly. Perhaps Yamagata Ken will be along. He has some tales to tell. ..and it has just started snowing here. Salt bins topped up this morning. Looks like central FFrance/St Etienne area copped an unexpected fall last night. Saw quite a covering over the Massif Central area earlier today. And I seriously thinking about catching up with swimming in the sea -I only went once this summer.